You’ve probably created or edited hundreds of files on your computer—maybe even thousands of files. From documents to photos to emails to everything else. Without good data backup and recovery, all of these files could be gone in a heartbeat. Imagine losing all of your email conversations, all of your precious photos, and all of the documents and spreadsheets you’ve put hundreds of hours into perfecting. Some of these things can’t ever be recreated. Some of them take longer to recreate then you would think—I once had to rekey 5 years of personal accounting data after losing my main accounting file. It took months of part time work. Sometimes when a disk drive crashes, you can use special techniques to recover some or all of the data. You can try freezing your hard drive to fix your failed hard disk or you can send it to a data recovery specialist. But these techniques aren’t guaranteed to work. 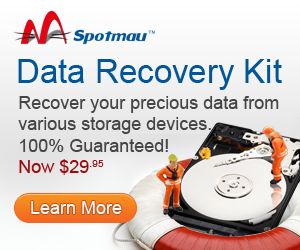 Good data backup and recovery is guaranteed—you guarantee it yourself. Find a backup solution. We’ll discuss several in the next section. Look for important files you missed. Repeat steps three and four until you’re sure you’ve backed up all of your files. There are two popular types of backup and recovery solutions in wide use today. The first has a high start-up cost but practically zero continuing costs; the second has a single monthly fee (which starts at $0). The first data backup and recovery solution is to use the Windows Backup Wizard in Windows Vista and Windows 7 or the Windows XP Backup and restore wizard. For this solution, you need an external disk drive on USB, eSATA, or a network share. Using the Wizard is easy: plug in your external disk drive if necessary, go to the Control Panel, launch the System and Maintenance menu, and choose Windows Backup Wizard. Use the wizard to choose which files to backup and tell it to back them up to your external disk drive. You can also schedule regular backups. The second data backup and recovery solution is to make backups over the Internet to a service like Dropbox or Mozy for online backup. Both services offer 2 GB of backup for free, but if you need more space than that, Mozy’s rates are currently much lower than Dropbox’s rates. Both use the same basic method: you install their software and select the files you want to backup. (In Dropbox, you select the files by putting them in your Dropbox folder; in Mozy, you select files in the Mozy Backup Manager.) Both programs automatically backup the files for you every time they change, so you don’t need to schedule any further backups. I have mentioned 5 types of computer backup storage previously which includes both the above mentioned. Create a folder called “Safe” on your desktop or in your Documents directory. (Dropbox users should use the Dropbox directory.) In the Windows Backup Wizard or Mozy, backup everything in this folder and all subdirectories. Now tell yourself not to open any documents, pictures, music, or anything else that isn’t in this folder. If it’s not in that folder, it’s not backed up, so you’ll eventually lose it—so why not start acting like you’ve lost it already? The only flaw in this system is that some programs keep their files separate—for example, your email program probably doesn’t keep your emails in My Documents. So now you need to tell yourself not to open any program with files you haven’t backed up. An easy way to tell which programs are safe to use is to rename them slightly. For example, after you backup your email in, say, Microsoft Outlook, rename it to “_Microsoft Outlook”. You’ll now know that any programs starting with “_” are safe to use. As you learn to open only files and programs that are in your data backup and recovery system, you’ll find lots and lots of data that you might have missed. Just keep backing up your data until you’re sure you’ve got all of it. It’s not enough just to make backups—you’ve also got to test that your backups are working, otherwise you could end up paying hundreds or thousands of dollars for a data backup and recovery system that doesn’t help you when your disk drive fails. You’ll have lost all of that money and all of your files. Go to a different computer and create a new user account. (I usually call it Test or Testing.) Then use the Windows Restore Wizard, Dropbox, or Mozy to try to recover one or two random files. It doesn’t matter which files you restore—you just want to make sure they restore correctly. If your data backup and recovery system restores the files correctly—great! If not, that’s great too because now you have the chance to fix your data backup and recovery system before it’s too late. It is also good to have multiple sources of backup. I had 2 hard drives fail on me within 24 hours. Thank god for the 3rd HD! Not sure if I trust online backups just yet. I think once internet connection will get faster and unlimited, then I’ll give it a go. At this time I have to pay here in Canada $5 for every 1GB over my 100GB limit. Imagine 2-3 TB??!! Nice read David, but the problem is most people do read about backing up there computer, and they say yes I must do it, infact I will do it tomorrow. But guess what they dont. Its so easy to backup your data, what with a simple zip drive, or an external hard drive, or on to disc. Data Backup is the most necessity thing that everyone should on a daily basis and if they not, then data recovery is the only possible solution for them. In these days, some great free & paid utility had made this process easier than ever. I have been using a Windows Home server to backup my computers hands free. I’ve even had to restore some of them, and the software has worked flawlessly for me. I would recommend it to anyone who wants a hands-off backup and restore option. I uses Genie Timeline Professional and backup everything on my local hard drive. I think I have to agree with you on recovering from backup because simply I had never try before even Genie actually provides Disaster Recovery where the entire OS able to recover. It makes me think whether the recover process actually works with Genie. I think you make a really good point and I agree that it’s certainly a nightmare to lose all your hard work in an instant. However, I’m not a very technical person and I’ve never done any back up on my files. I usually ask my friend to do this for me but only when he has some free time so I just keep an external drive. So far it has worked for me and I find it a lot more convenient. Great post, David. I just read somewhere else that “World Backup Day” is coming up on 3/31, so it’s definitely timely. I usually get peeved at new days popping up like this but it’s such an important topic that I think we can all agree it’s worth drawing attention to. I just started using Amazon Web Services for my backups. I could probably get by with an external USB drive but with all my client data and needing to backup multiple computers, putting things on the cloud seemed like the best choice.